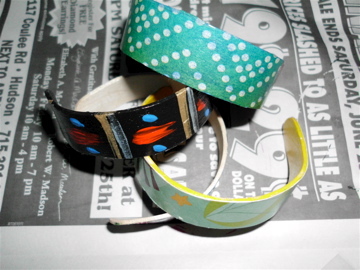 When surfing around on the internet I came across this great site called Dollar Store Crafts (check it out) and saw a tutorial for popsicle stick bracelets. I thought they were so cute of course I had to try them out! I went to the local Wal-Mart and got a box of 300 sticks for like $3.00. I love cheap crafts btw. I found I had to simmer them in water for about 30 min then let them sit in the hot water for another 30 before they became bendable without breaking. I used canning jars as the mold and anchored each one with clothes pins. 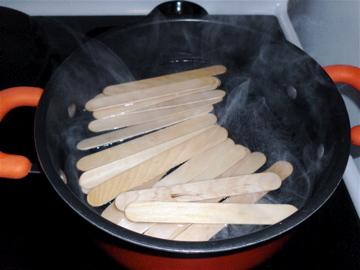 Allow to dry for at least 24 hours before taking them out of the jar or else they will start to straighten out. I sanded each one so they were all nice and smooth. You can use a variety of things to decorate them. 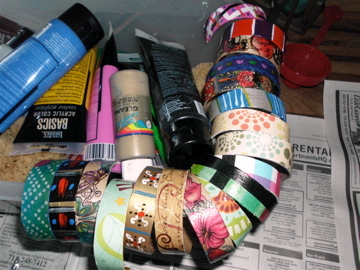 I used paint, scrapbook paper, temporary tattoos and tissue paper to make mine all pretty. I gave each one a couple of coats of glossy Mod Podge and let them dry. Didn’t they turn out great? I got a pretty good response at the farmer’s market today. I am selling each one for $3.00 since they take a minimum of 2 days to complete. I have had requests for smaller ones and I am going to try to work out how to curve them more without breaking. We have made these several times. love it!!! great craft!!! !